Last week, Martha M. Ezzard won Best Memoir at the fiftieth annual Georgia Author of the Year Awards for her work The Second Bud. Today, we have an excerpt that will leave you craving the best wines that Georgia has to offer. Enjoy! It is during our Norton vineyard’s second leaf when John discovers he can’t get the tractor between some of the rows. The reason, although Coach is loath to admit it, is that the two of them had relied on Coach’s alleged twelve-foot board to measure the distance between the rows when they were installing trellises. The problem was that Coach had two boards in the back of his pick-up—a twelve-foot board and a ten-foot board—and had pulled out the wrong one for spacing some of the rows. John finds it impossible to drive his tractor or sprayer between six of the Norton rows, which are only ten feet apart. It’s early April—the canes on the vines are “bleeding” as the tiny buds wake to another spring and begin to swell. To walk through the rows is to absorb the energy and anticipation that something is about to happen. There is nothing routine about bud break; it’s always fresh and challenging—as if a new movement of a great musical composition is being created each spring. The wonderful and informative video tribute to Ella Gertrude Clanton Thomas by the Georgia Women of Achievement is now available. Take note of her biographer Carolyn Curry’s narrative of the amazing woman’s life. 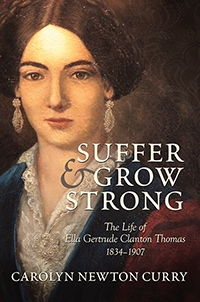 Learn more about Thomas in Suffer and Grow Strong: The Life of Ella Gertrude Clanton Thomas, 1834-1907. As the first battle of Sherman’s Atlanta Campaign, the Battle of Resaca can be said to be one of the first death knells of the Confederacy. It would also be the first major encounter between field commanders William T. Sherman and Joseph E. Johnston. Join the battle and the first steps towards Atlanta’s demise in Mercer’s Battle of Resaca! Enter discount code MUPNEWS when you order at the Press’s website and receive a 20% discount plus free USPS Media Mail shipping on your entire order! Two Books to the Mill This Week! Under the watchful eye of Marsha, another two books have made it to the mill! Gould Hagler’s Georgia’s Confederate Monuments and Martin Harmon’s The Warm Springs Story are bound to please the history buff in your family. Click on the images below and order your copies today!